As previously explained in earlier articles there has been an attempt to censor and filter my teaching of our Christian Heritage in American History at both the High School and College level during my 27+ year career. As we approach the autumn holiday season we will once again see the "War on Christianity" intensify as American citizens will express their God given freedom of Religion, Speech and Press at the dismay of the ACLU, the Freedom From Religion Foundation, MSNBC and the Progressive LEFT. They will once again come out swinging with their lies and twisted history to pervert the Truth as they attempt to infiltrate and indoctrinate our Youth and millions of American citizens with their re-written secularized version of our great Christian history. FACTS, TRUTH and the EMPIRICAL-HISTORICAL evidence is on our side. 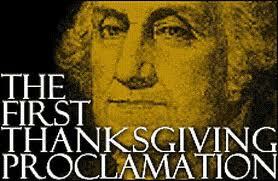 Read and Study the October 3, 1789 Thanksgiving Proclamation below. Note: It was signed by the very same Congress that passed the 1st Amendment and by our 1st President, George Washington. This VERY Christian official Federal Government Proclamation was issued to Thank God Almighty for our Constitutional Republic under Him. The Anti-Christian Progressive-Secular LEFT hates those facts as they don't know what to do with our Christian Heritage except to lie and deny that reality. We must fight their lies! Please share this Proclamation with your friends and neighbors. 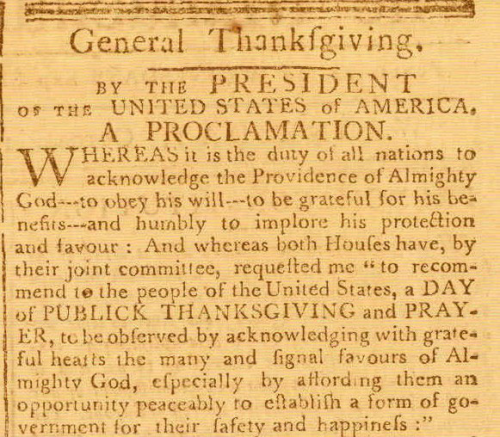 Here are the original words of the October 3, 1789 Proclamation. Note how Christian the language is as it calls for obeying God's will, forgiveness of sin, and prayer. Sorry ACLU, FFRF and Lying Lefties Read it & Weep!!!! establish constitutions of government for our safety and happiness, and particularly the national one now lately instituted; for the civil and religious liberty with which we are blessed, and the means we have of acquiring and diffusing useful knowledge; and, in general, for all the great and various favors which He has been pleased to confer upon us. And also that we may then unite in most humbly offering our prayers and supplications to the great Lord and Ruler of Nations, and beseech Him to pardon our national and other trangressions; to enable us all, whether in public or private stations, to perform our several and relative duties properly and punctually; to render our National Government a blessing to all the people by constantly being a Government of wise, just, and constitutional laws, discreetly and faithfully executed and obeyed; to protect and guide all sovereigns and nations (especially such as have shown kindness to us), and to bless them with good governments, peace, and concord; to promote the knowledge and practice of true religion and virtue, and the increase of science among them and us; and, generally, to grant unto all mankind such a degree of temporal prosperity as He alone knows to be best.